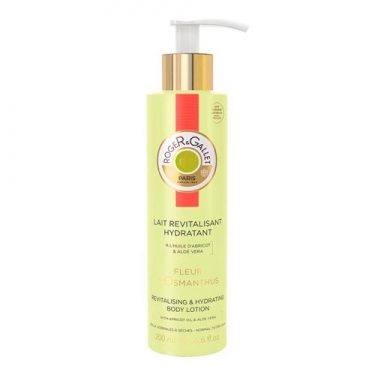 DESCRIPTION: Fleur dOsmanthus Lait Tonifiant Hydratant from Roger et Gallet is a body milk enriched with vegetable oils aloe vera and apricot oil. It is a milk that moisturizes and revitalizes normal to dry skin. Its light and fresh formula instantly melts in the water and leaves the skin incredibly soft and deliciously fragrant floral and fruity notes of Osmanthus Flower. Apply to the body daily, preferably after bathing.